A familiar and powerful user interface for entering and manipulating data. A wide variety of formatting options for altering the appearance of results. The presence of a sophisticated charting package that allows both the manipulation of charts produced by Statistical Analysis for Excel and the manual creation of new charts based on output. 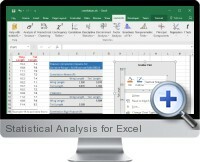 The ability to perform further ad hoc analysis using Excel's own built in functions and calculating abilities. Clustering - Hierarchical clustering of binomial, quantitative and mixed datasets is supported. Contingency Tables - Both 2-way and multi-way contingency data can be analyzed. Correlation - Simple, Partial, Multiple and Canonical correlation is supported. Descriptive Statistics available for both linear and circular data sets. Discriminant Analysis - Both Grouping and Classification methods of Discriminant Analysis are supported. Factor Analysis can be performed on either the correlation or covariance matrix of the raw data set. Linear Regression - Simple and Multiple Linear Regression is supported. Nonparametric Tests - Numerous Nonparametric Tests are supported including Friedman, Kruskal-Wallis, Mann-Whitney, Mood's Median, Sign, Spearman, Wald-Wolfowitz and Wilcoxon Paired-Sample tests. Principal Component Analysis is provided as a means for the reduction of large multivariate data sets into simpler structures. t Tests - One and two sample, uni-variate and multivariate t tests are supported.